The book, Golden Rule Civility, is a thinking book, a starting point for conversations and awareness raising about the importance of building cultures of honour. The concept of honour is a key aspect of The Golden Rule Civility Global Initiative co-founded by the authors. All around the world, there is evidence that we are experiencing a crisis of conscience, of character, and of civility. We need a solution. Golden Rule Civility is the way forward. 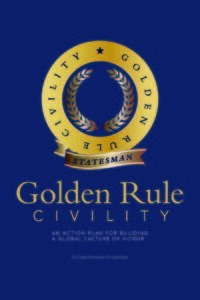 The mission of The Golden Rule Civility Global Initiative is to offer new ways of thinking, skill-building and incentives to move people all around the world towards building cultures of honour. As we honour people in any arena of life, the culture around us changes. It is time for change. “There are over seven billion people in the world and they have to communicate effectively daily to move society forward in a positive way,” states Dr. Clyde Rivers, “experiencing the chaos we see every day from our media outlets and the social media machinery, is wearing away our character and we need to find our way back to positive people-treatment and honor”. Golden Rule Civility, is coming on the scene of societies of the world at this time because of growing global uneasiness. Cultural differences are being magnified and not embraced, causing violence and unrest. The co-authors recognize that with chaos all around us this is a time in history that the world needs this more than ever. Institutions, businesses and organizations, we have a solution to increase production, create a better people treatment environment and educate in civility. This solution is needed within every system that runs the world. If we want to see the contribution of everyone enhance our world, seven billion people have to discover how to move the needle of success forward on a daily basis. Contact drrivers.worldwide@gmail.com to speak with Dr. Clyde Rivers.